It’s been a truly dreadful few weeks for the UK, I can’t remember a period like it before for utter horror. We made an attempt at escapism and this post is the result, on our way home the events in London of the most horrific fire were unfolding. There are no words, but only to say that hope that there is #justiceforgrenfell and I hope it comes sooner rather than later. Our form of escapism came in the shape of a slightly unexp ected trip in Cornwall, part of which was choreographed by my brother and sister in law who invited us to stay a few days in a cottage they had rented in Boscastle on the north Cornish coast. A chance to stand and stare…and also do a spot of fishing?! Up at the crack of dawn and down to the tiny harbour, all of us with some misgiving or another – mine being how on earth I was going to board the boat with a broken leg! The Minx, being from a landlocked country is a landlubber by nature, so there was that. Karl-Heinz was concerned about ‘the Mrs’ and wondering if he would find his sea legs. Rocket, as ever, seemed to be fine…. Following a very rocky start into the open sea, we discovered three things; that Rocket’s bravado was misplaced and his sea legs deserted him, that Swiss people can fish (The Minx was reeling them in) and that whilst myself and Karl-Heinz seemed to share a genetic predisposition to being salty old sea dogs, and my sea ‘leg’ did quite well, we aren’t actually that keen on the ‘death’ part of this fishing malarkey. (On my first catch, I blurted out “oh no, I’ve caught one”. Back to the tale. 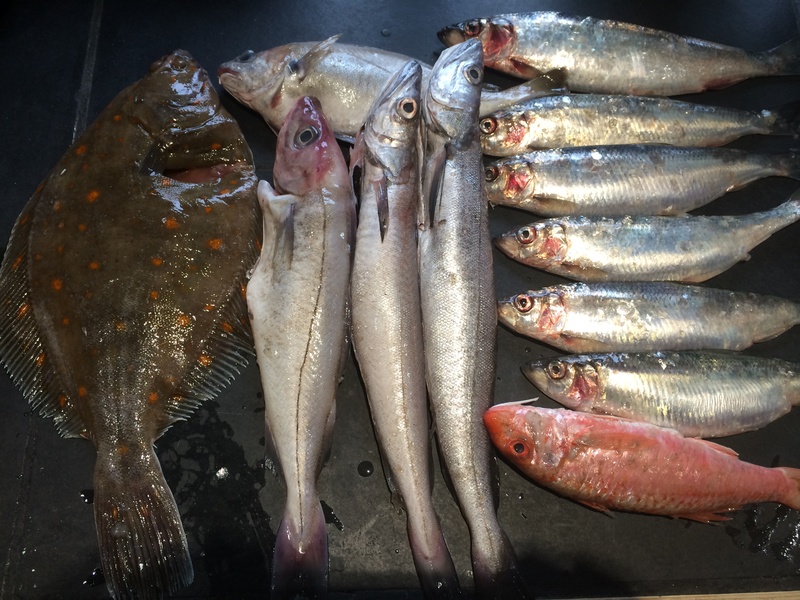 We all managed to contribute to the haul of beautful Cornish mackerel, and pottered back to our cottage, clutching our prize and discussing what we might do with it for supper – because one thing we are all clear about is that if you catch it, you must eat it, there can be no waste. On the night, there was a fine ‘English’ sushi by Karl Heinz, made with long grain rice because that is what we had, and a little English mustard in place of the wasabi, some home pickled ginger and of course, the freshest of mackerel. 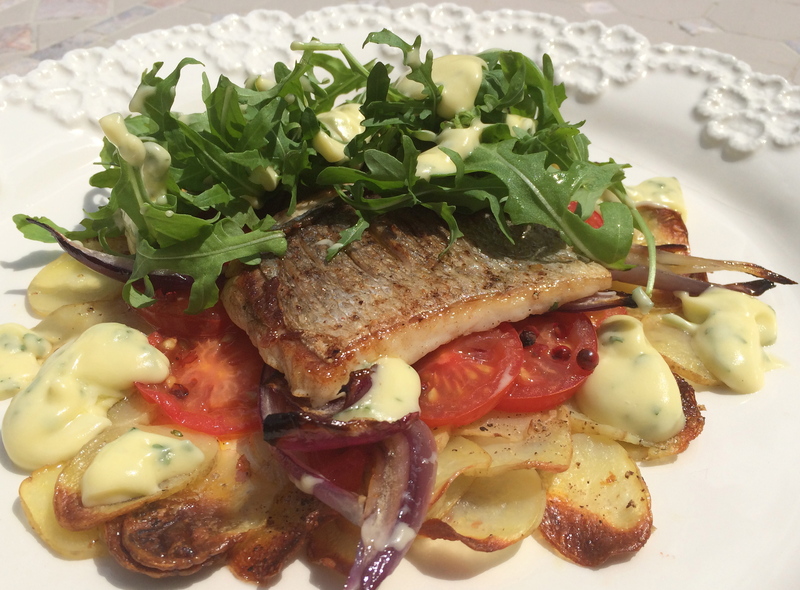 This was followed by some pan fried fillets, with simple salads to do the fish justice – we’ll probably never eat fresher fish. Returning home the following day, Rocket cold smoked some of the fillets, We had some smoked and some unsmoked accompanied by a few horseradish crushed jersey royals, a salad of broad beans from our garden with peas, natsurtium and watercress dressed with our home grown mint and a tartare of mackerel with radish and apple. Great ingredients, simply prepared and appreciated by us. We’ve ha d a longstanding love affair with Cornwall, and in this sad and demotivating year our spirits were lifted by those south-westerly winds, dramatic rugged coastlines, quaint villages and ancient coves. We hope for better times.